Glacial temperatures, goofy costumes, glorious competition, and glazed donuts; is there a better way to spend a Saturday morning? On February 3rd, 2018, thousands of runners braved the cold to participate in the 14th annual Krispy Kreme Challenge. 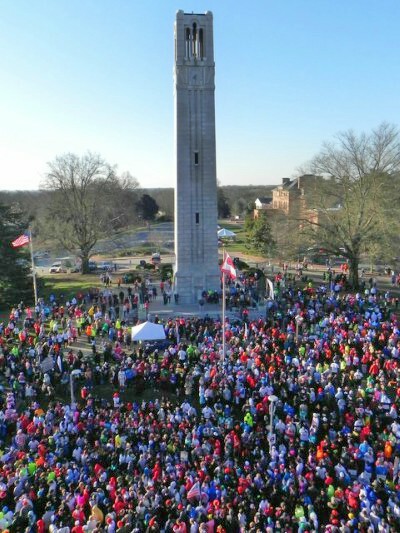 Participants ran from the NC State Memorial Bell Tower to Krispy Kreme and back to complete the five-mile run. Awaiting runners at Krispy Kreme were thousands of donuts, one dozen for each race participant. While fun-runners aren’t expected to eat all twelve donuts, serious competitors must finish the dozen before running back to the Memorial Bell Tower. This challenge is a true test of cardio strength and gastrointestinal fortitude. 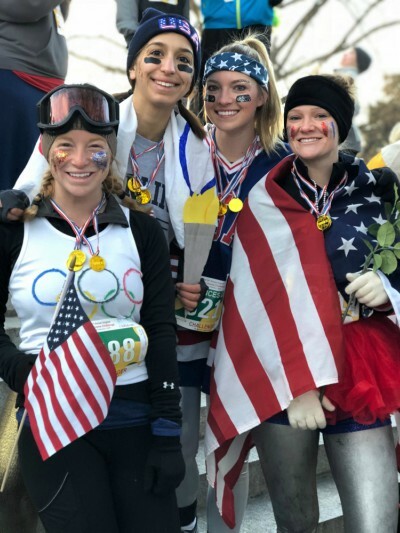 Undergraduate Seniors Anna Claire Joyner, Morgan Ferone, Lee Mueller, and Kathryn Moore created an Olympic-themed team for the 2018 Krispy Kreme Challenge. The Krispy Kreme Challenge began in 2004 as a dare amongst ten NC State Park Scholars and their friends. Now, the race garners national attention for its unique concept and philanthropic success. Over just 14 years, the Krispy Kreme Challenge has raised more than $1.4 million for UNC Children’s Hospital. This year (2018), the race fundraising total was $170,000. The Krispy Kreme Challenge has become an emblem of both NC State and Hillsborough Street. The race attracts runners of all ages from near and far. Students often put running the Krispy Kreme Challenge on their “NC State Bucket List.” For those uninterested in running the race, there are several other ways to get involved with this one-of-a-kind Raleigh tradition. The Krispy Kreme Challenge offers the options to fundraise, donate, and volunteer for the event through their website. The Krispy Kreme Challenge 2019 date is still to be determined, but the race traditionally takes place in February.